One beekeeper in the Czech Republic had a serious accident. He fell off a ladder and was injured quite seriously. 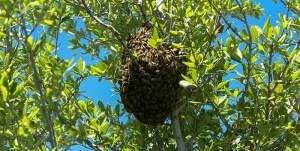 This happened in May in the time of fruit trees honey flow. The beekeeper had to be hospitalized for more than a month. He could not, therefore, carry out the formation of splits or take other anti-swarming measures. This gentleman realized that certainly, all his colonies would swarm because the colonies were left to develop naturally. When he was able to go to check his bees, indeed he found most of them swarmed and therefore with a small amount of honey only. However, some colonies had not swarmed, and on the contrary, those were full of honey. The beekeeper considered these colonies as non-swarming genetically, and he purposely bred mothers from them. He then distributed these mothers among friends, believing that those are naturally non-swarming bees, which need not be controlled with any anti-swarming measures. These friends had these mothers hived and carried no anti-swarming measures as advised. And … the bees all swarmed at the first opportunity. Only when I published the finding that the breeding of drones does with certain intensity remove swarming moods, everything became clear. As the frames were wired vertically, the overflowing combs in the brood melted and slumped during warm days creating empty space in the middle of the brood chamber. Colony filled it with drone comb and the mother immediately reared the brood. But when the colony establishes such a large area of drone brood, then they must take care of them. Thus it can not divide and weaken by swarming because the swarmed colony would not have enough workers to provide for the drone brood. What’s more, the slump of the combs in the centre of the brood chamber is a condition threatening the thermal stability of the colony and needs to be urgently addressed. Since the survival instinct is stronger than the instinct for reproduction, bees abandon the need for swarming. Instead, they work to consolidate the brood nest with drone comb, breeding drones. This anti-swarming phenomenon can be effectively utilized in practice. In the next posts, we will talk about how.